The Foundation Saga is Sci-Fi’s most well known collection of novels, principally as Science Fiction isn’t wont to create sagas, a habit propounded by Fantasy. 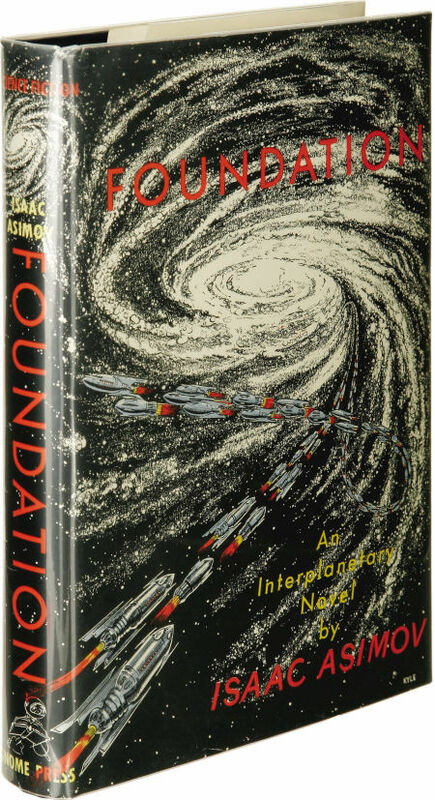 Written by Isaac Asimov, known as one of the three SF giants along with Arthur C. Clarke and Robert A. Heinlein, The Foundation Saga begins with the first installment, Foundation, published in 1951 and originally started out as a collection of short series, then later a trilogy, and then was finally expanded into a full series, with preludes and everything. No series is complete without some discord in chronology. The novel is set on many worlds, over many years and with many characters, with the overarching plot concern ‘the Foundation’. 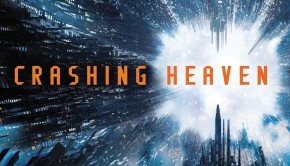 What started as a group of scientists exiled to a distant uninhabited planet in the periphery of the moribund Empire, soon expanded into its own power vying to rival and overthrow the Empire, whose technology is waning and the economy lapsing into a steady decline, predicted to destroy itself inside of 500 years. The world’s cheesiest first edition. You can already see physics defying rocketry going on! The initial creation of the Foundation begins with Hari Seldon, a professor of Psycho-history, a teaching which is not widely known or practiced, which deals in calculated prediction of future events governing a large group of people. Seldon uses this skill to predict the destruction of the Empire and decides it is time to take the situation into his own hands. He begins by playing off the Empire’s central planets court systems against itself, using his own predictions and stabilising of events, he manages to direct himself into being exiled from the Empire under the guise of creating an Encyclopaedia, designed to slow the effect of a long reign of technological lull resulting in his proposed decline of the Empire, the very idea of which is considered treasonous. Instead he wishes to be secluded and left alone with a group of like-minded individuals to start a new order. This genre of Sci-Fi, which can be described as a Political Space Opera, is bit of a turn for Asimov, the creator of the 3 laws of robotics. As a Bio-Chemist who frequently writes about Sci-Fi mysteries about Robots and morality, mostly in the form of short stories and small novels,a long running series is a bit of a dive into new territory, so much so that I was incredibly surprised about the content of the book completely lacking robots, opting instead to focus on human drama and religious themes. Religious themes? I know that a lot of people are very wary of the term “Religion” when it comes to Sci-Fi, I never really understood why as surely it is one of the most interesting themes to explore whatever your own religious beliefs. Foundation employs a very cynical view of religion, where it is used for financial and economic gain, a tool in politics. Politics is one of the biggest parts of this book. From the creation of the Foundation from the ashes of the Empire, to its own struggles against rivalling planets, each character from the different eras are faced with their own problems they must face and succeed in using the ingenuity to overcome for the sake of Foundation’s future. The Panther edition is one to avoid as it is full of typos. The story is weaved around interpersonal and inter-spacial politics, the twists and turns from his mystery-styled robot works still makes an appearance here, with the plays from the characters being obscured and the reasons for apparent nonchalance kept secret until the final scene, where all is revealed. The plot is full of intrigue and makes for very addictive reading. If I had to compare this to another book, then it’s a little bit like Game of Thrones in space. 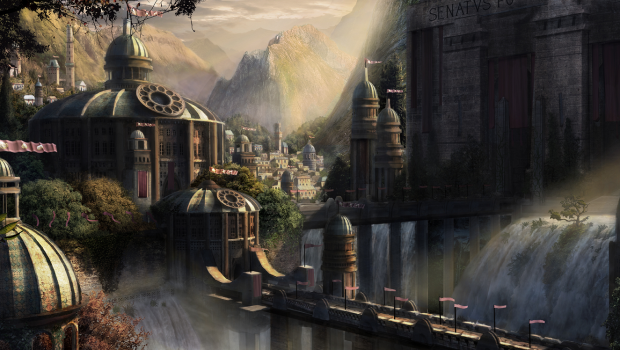 There were some notable omissions from the novel, for example, the main city of Trantor at the very beginning is treated to a paragraphs of descriptive immersion, however the lack of technological explanation or even some general idea of architecture for the subsequent cities, planets and ships was extremely lacking. 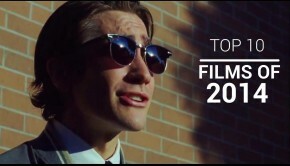 The first of the main characters is also made to feel very much like he had purpose and was going to last. I was rather confused and kept wondering whether we would be going back to first timeline as it seemed so over-characterised for what little pagetime it ended up getting. Pagetime = Like screentime, but in a book. The characters were great and the dialogue, like in most Asimov work, drives all of the plot, but the lack of female characters and diversity made some of the novel cramped and stifling. It seemed there were only 3 kinds of people in the book; stupid, angry or intelligent. Which is all very well for the set up of a novel and storyline, but I can’t see it working in later novels. One of my editions had a lot of errors and typos in, that’s the Panther 1985 version which is pictured, so I would avoid that one, but other versions are much improved. There are 7 books in the series total so it can always be a pain if your rather picky about getting a good-looking set going. 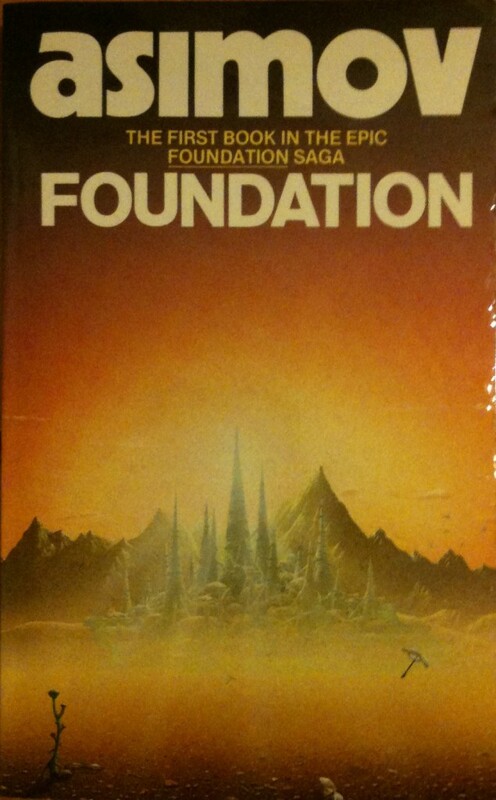 Foundation is rightfully considered one of the best Science Fiction novels written by one of SF’s greatest writers, wonderfully paced and uniquely exciting, it provides a great canvas for Asimov to extoll brilliant ideas of philosophy and the creation of civilisation. This book belongs on any bookfan’s shelf.